Argentine ants are one of the traveling ants and may travel 200 feet or more with thousands of ants following each other from the nest to a food source. The wingless worker Ant (most commonly spotted), is light to dark brown, about 1/12–1/8-inch long. The winged queens can produce fertile eggs for up to 10 years after mating once with a winged male. Another difference in this type of Ant compared to other ants is that several productive queens can share the same colony. The worker ants can easily squeeze through cracks and holes. Queens are two to four times the length of workers. 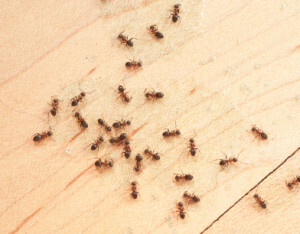 These dark brown to black ants give off a musty odor when crushed. They have been extraordinarily successful, because different nests of the introduced Argentine ants seldom attack or compete with each other, unlike most other species of ant. They are so uniform that individuals from one nest can mingle in a neighboring nest without being attacked. Due to unusually low levels of intraspecific aggression the Argentine ant can team up with other colonies, which can form supercolonies. This contributes to its status as a nuisance pest in homes and its ability to spread rapidly. Argentine ants present a problem not only to our ecosystem and our homes, but also to farmers’ crops and our gardens. One or more of these productive queens may leave with some of the workers to form a new colony when it gets crowded (this is known as budding). As few as ten workers and a single queen can establish a new colony. Argentine ants are omnivorous, meaning that they can eat almost anything, but they prefer sweet foods such as syrup, fruit juices or plant secretions, but will gather protein/grease-based foods to bring back to the queens and larvae. Argentine ants can be found in moist areas, nesting under logs, along sidewalks, trash, mulch, rotten wood, faulty places in trees, beneath plants, under homes and other places. They can form nests in exposed or covered soil, but they have poor ability to dig deeper nests. Argentine ants may seek shelter indoors when it becomes too wet or too dry. Argentine ants crawl on or in every imaginable place such as stoves, refrigerators, shelves, beds, and clothing. Often looking for moisture, Argentine ants may be found on water pipes, dish washers or other wet locations. Argentine ants are a common household pest, often entering structures in search of food or water (particularly during dry or hot weather), or to escape flooded nests during periods of heavy rainfall. When they invade a kitchen, it is not uncommon to see two or three queens foraging along with the workers. Eliminating a single queen does not stop the colony’s ability to breed.